At age 26, Colin became a full-time professional artist and has exhibited his work all over the world. He mainly paints traditional landscapes but also dabbles in humorous pieces and modern art. About the artist: Colin Ruffell is a painter and print-maker artist living in Brighton. He has been a full-time professional artist for over 50 years, and during that time has painted thousands of original paintings and printed thousands more limited edition and open edition prints. His styles are varied and include iconic cityscapes of London, New York, Venice, Hong Kong and Brighton, plus landscapes of English and Scottish countryside scenery and Mediterranean views. He also paints abstracts, traditional still lifes, animals, kitchen scenes and local views in a naive child-art inspired style. 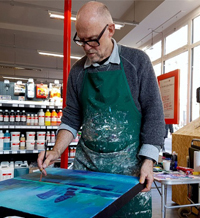 He primarily uses acrylics, watercolours and oil paints, and publishes his prints using a wide format archival quality inkjet (giclee) printer on paper or canvas.